"Mind the gap" all rounds of the 2011 GRC will feature an XGAMES style 70ft gap jump. Photo Neil McDaid /RallyWorldNews. Irwindale CA. European style RallyCross is back in the United States and organizers are already promising to bring us to new heights in this highly charged form of Motorsport in 2011. 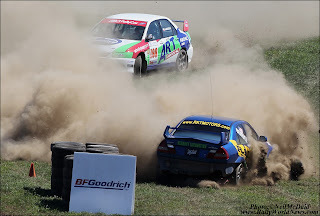 After a very successful series of RallyCross events run by RallyCar in the fall of 2010, at New Jersey Motorsports Park [NJMP] we are now only weeks away from the opening event of the 2011 U.S. RallyCross season. The new season also brings a new championship series to the mix. The first three RallyCross events this year will be run under the Global RallyCross Championship [GRC] banner. 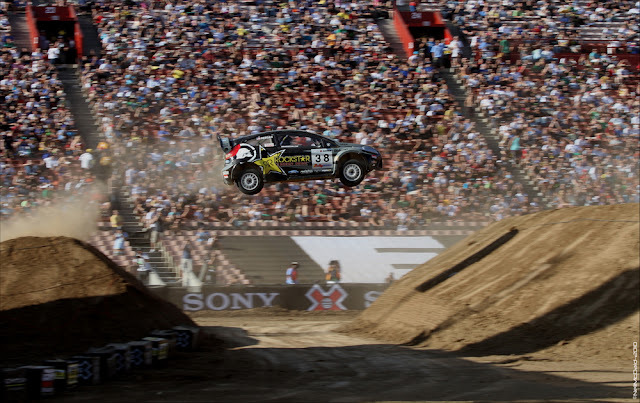 Under this new organization, drivers will now be competing door to door for their place at the XGAMES 17 in Los Angeles whereas in prior years, drivers would qualify for the XGAMES through the Rally America stage rally championship. Three additional rounds will be run by RallyCar for the U.S. RallyCross Championship after the XGAMES. These rounds will be run in conjunction the Torc Off Road Racing Series where the organizers have already disclosed a very attractive cash purse. It’s important to note that drivers who compete in the GRC events will also be eligible to score points towards the 2011 U.S. RallyCross Championship. ﻿ Round number one of the GRC, “The Revolution,” will be held at Irwindale Speedway in California in less than two weeks time. Because of the late confirmation of the series, many teams are left scrambling to get ready. We may not see a full field in Irwindale, but it may be a case of quality over quantity. The course layout at Irwindale will feature 60 percent tarmac and 40 percent dirt. All GRC events will feature an XGAMES style 70-foot gap jump. Round two, “Twin Peaks,” heads northwest to Seattle, Washington. The location has all the components for a Ken Block Gymkhana video, set in a rural industrial complex with a course layout of 50 percent dirt and 50 percent tarmac. Drivers will drive through structures and various tarmac sections before taking on the 70-foot gap jump. Round 3, “Last Chance,” is just that, a last chance to get into the XGames. Teams will head to Pike’s Peak International Raceway in Colorado. The course layout is expected to be similar to Irwindale. This GRC RallyCross event will also serve as an opening event in a week of speed leading up to the famed Pikes Peak Hill Climb. While the AWD cars will be racing for a place at the XGAMES, GRC organizers will offer cash prizes for drivers competing in the 2WD Class. The top scoring 2WD driver after the first three rounds will also get an invite to compete at XGAMES 17, but they will have to do so in an AWD if they chose to attend. There is no question that the USA is primed and ready to embrace RallyCross. 2011 will be a building year for the series and hopefully we will see more drivers jumping in as the rounds progress. The sport really needs to build on its grassroots drivers and not solely depend on star drivers to make this work. The confirmation that all rounds of the GRC will be televised by ESPN is a great boost to the growth of the sport and will aid drivers in their search for sponsors. Entries are slowly trickling in for round one of the GRC. 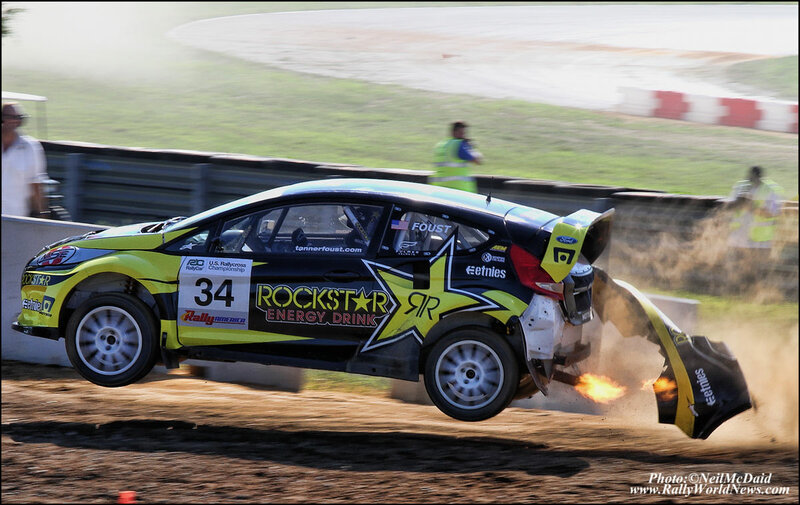 After an impressive showing at NJMP in 2010 Tanner Foust will be back in his RockStar Energy backed Ford Fiesta. Tanner is definitely a hot favorite for the overall victory. Also for round one, it looks like we will see WRC Champion Marcus Gronholm make an appearance. Marcus will pilot one of the OlsbergsMSE 2011 Fiestas. It will be interesting to see if the fans in the stands at Irwindale appreciate the greatness of Gronholm. He seemed to wonder among the crowd at Pikes Peak Hill Climb sometimes unnoticed when he competed there two years ago. Rhys Millen, an experienced rally driver who has been successfully competing in the Formula Drift series in recent years, is now making his transition over to RallyCross. Millen jumped in for the final two rounds at NJMP in 2010 to get a feel for the discipline. He arrived in style in a WRC Hyundai Accent. Over the winter the team at Rhys Millen Racing [RCR] has been hard at work developing two all new 2012 Hyundai Veloster for RallyCross. The car was recently unveiled to the public at the 2011 Chicago Auto Show. Rhys will be joined in Irwindale by his new teammate Macus Dodd in the second Veloster. 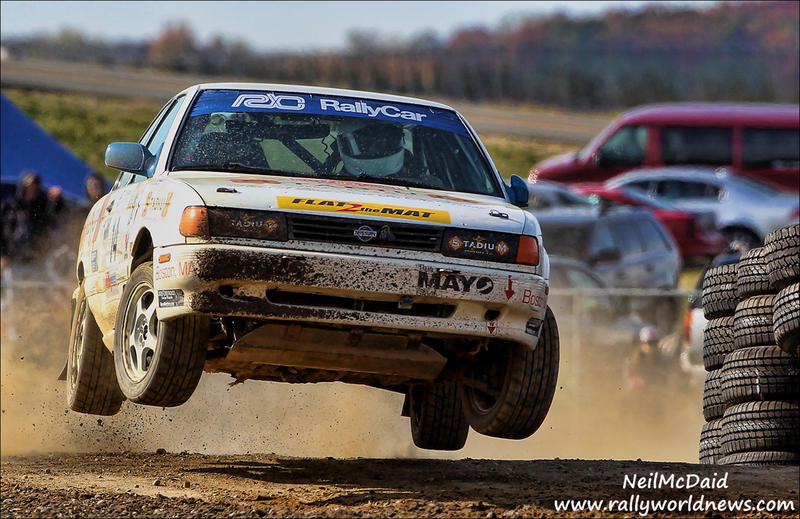 Dodd, who is a five-time British National Rally Champion, brings a wealth of knowledge to the RCR/Hyundai team. We also expect to see Subaru Rally Team driver Dave Mirra in the lineup. At this time we have no indication of a second car from Subaru, but it is early yet. Another Pro-drifter in transition to RallyCross, Stephan Verdier who got an invitation drive at XGAMES 16, will take to line at round one in his Subaru. 2010 Rally America Rookie of the Year Joseph Burke will be looking to jump his way into the XGAMES 17. Burke will most likely compete in a Mitsubishi Evo 8. Burke did compete in RallyCross in 2010, and was an instant fan favorite. Other drivers who we fully expect to see at round one are Andrew Comrie-Picard, Pat Morro and Arkadiusz Gruszka. Due to schedule conflicts for round number one it’s highly unlikely that we will see any of the European RallyCross drivers that we had at NJMP in the fall of 2010, but we expect to see some trickle in for rounds 2 and 3. Organizers have also made mention of several new manufactures showing more than a passing interest in the Global RallyCross Championship. With the exception of the XGAMES we have yet to see Ken Block get into the RallyCross mix. 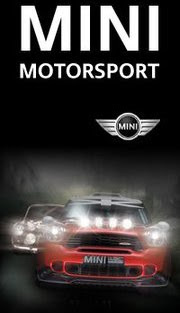 With his 2011 WRC schedule it’s going to be difficult for him to make any of the opening rounds. Ken has expressed interest in RallyCross but still has a strong desire to compete in at least one round of the Rally America Championship in 2011. As a past medal winner Ken is already confirmed to compete at XGAMES 17. It’s no secret that many European RallyCross and rally drivers harbor a great desire to compete at the XGAMES, so we fully expect some world class drivers to enter a round or two of the 2011 GRC.